Gone are the days when graffiti is merely seen as a nuisance to the streets, an act of vandalism. Street artists now take to spray paints, stencils and a good pair of running shoes for creating beautiful, public murals under the nose of the police. Graffiti is not only an aesthetic tool, but a tool for propaganda too. Graffiti is giving voice to the oppressed; where otherwise would be left unseen and unheard. 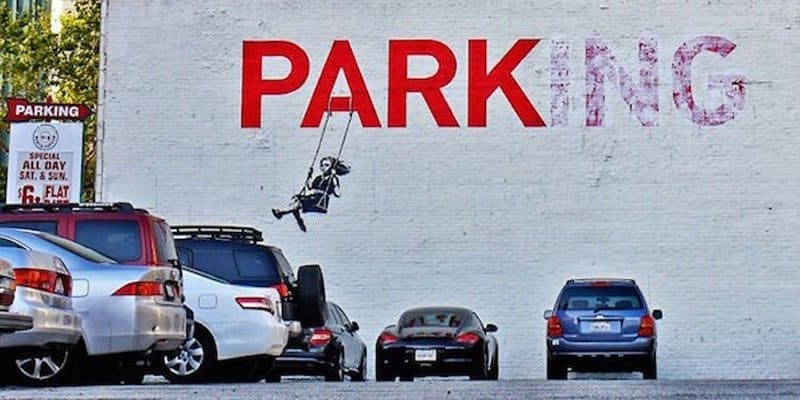 What is more public than taking art it to the streets after all? 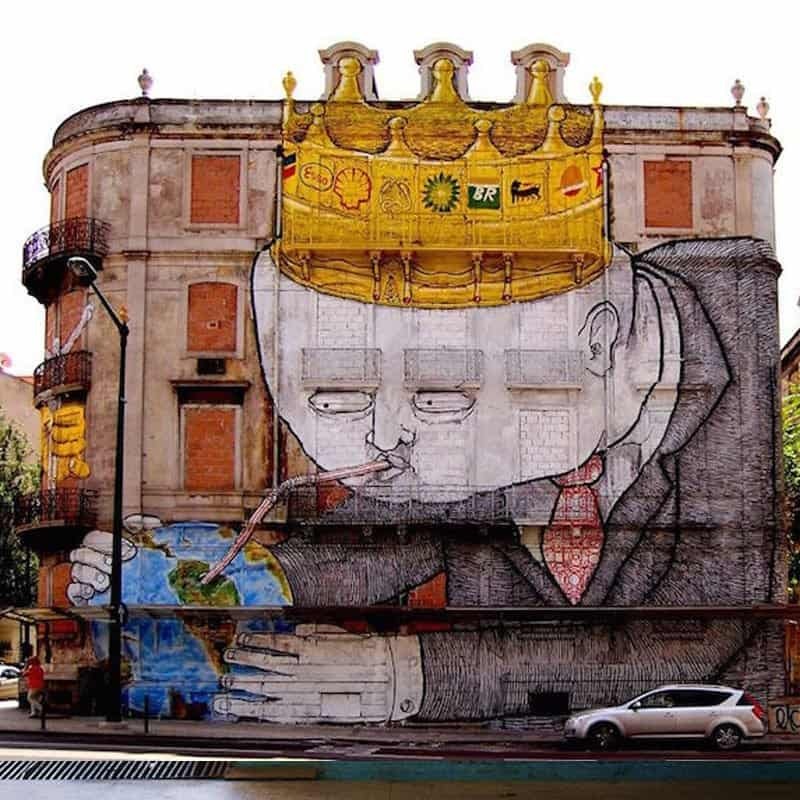 We’ve compiled a list of 15 heartbreaking street art from around the world. 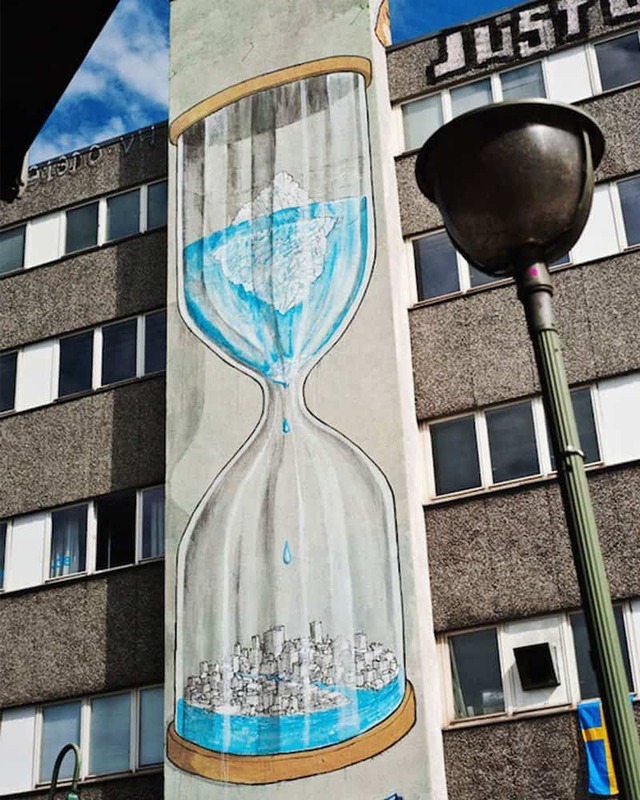 The street art displays powerful messages on various topics: environment, social justice, animal cruelty, and other world issues. 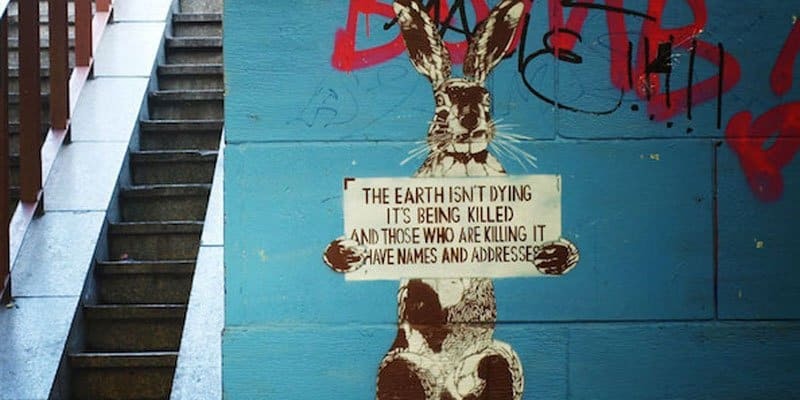 The compelling messages from street artists are clear and poignant: humans need to make a stance. We need to make a change. 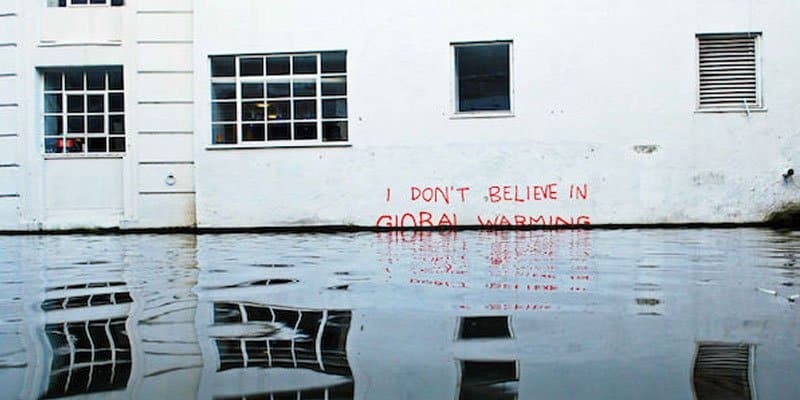 An intriguing street art by Banksy, the ironic play between the sprayed on text and the flooding water shows an alarming truth about global warming: it is happening. The bunny couldn’t say it any clearer. Earth isn’t dying, it’s being killed by people with names and addresses. No other creature has walked off the earth that is more parasitical than human beings. We are literally sucking the life off the earth because of the vile multi-national companies we have created. 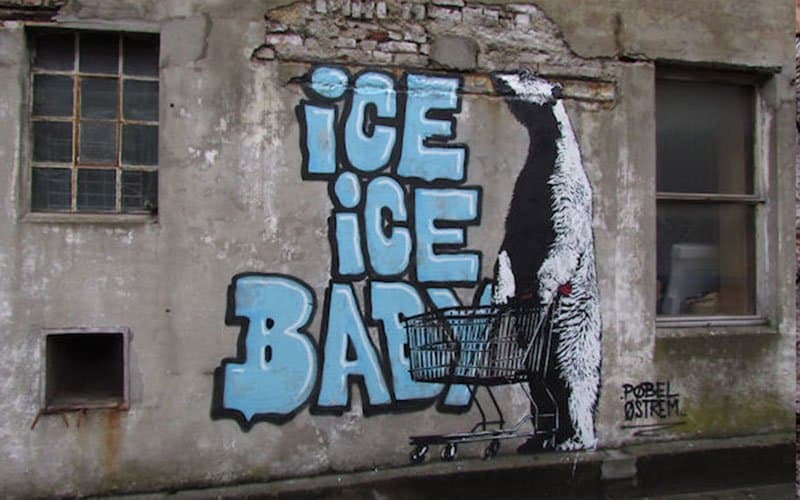 On this graffiti art, we see a polar bear apparently shopping for ice, juxtaposed with the words from Vanilla Ice song ‘Ice, Ice Baby’. The fact is, the glaciers are melting, and polar bears are dying. 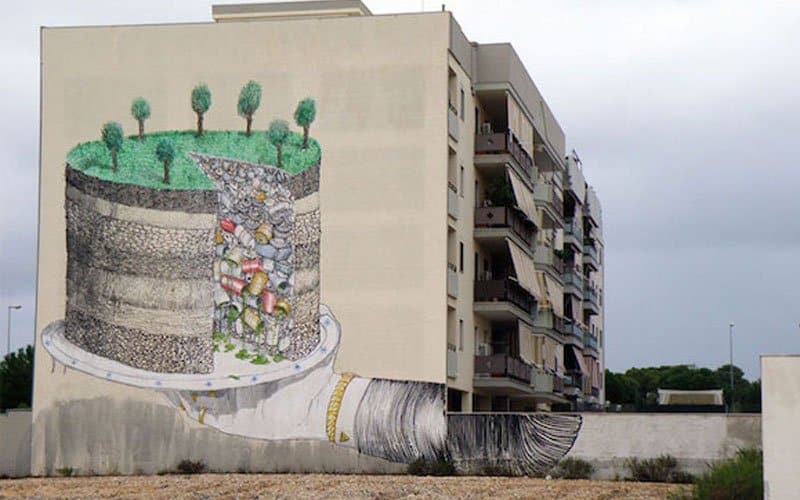 This compelling art shows us how society has created a false world with perfectly lined trees and evergreen grass. 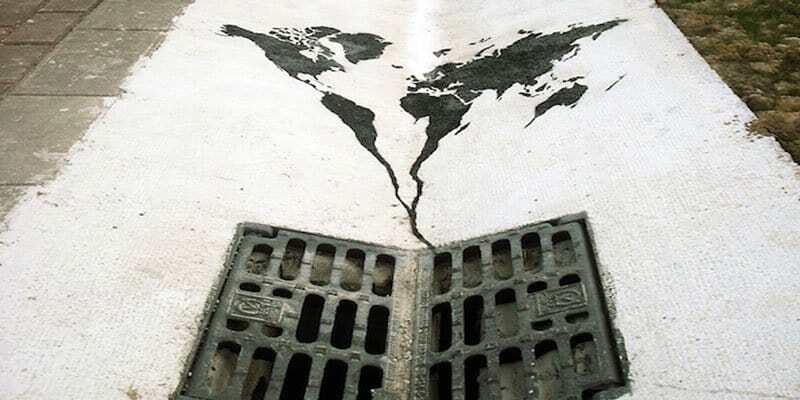 In reality, we are filling up the world with ugly trash and hiding them behind these fake impressions of paradise. Yes, the animal characters in the animated movie ‘Madagascar’ may all look lovely. 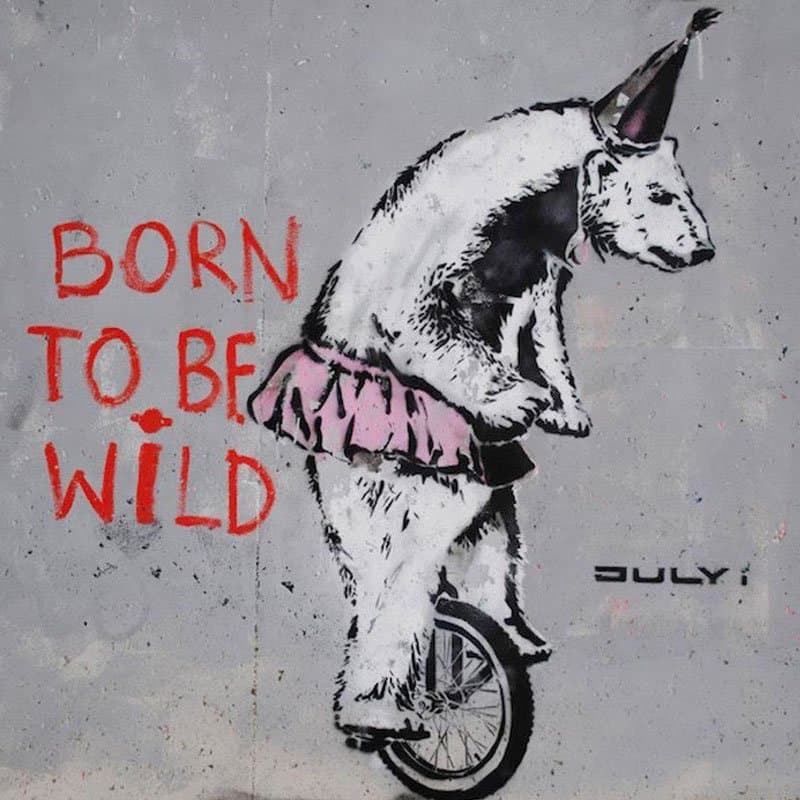 But in reality, animals are not meant to be humans’ entertainment or playthings wearing a tutu skirt or a funny hat. They are born to be in the wild. Belgian artist ROA creates compelling street art that shows the devastating effects of our human actions towards the environment and living species. 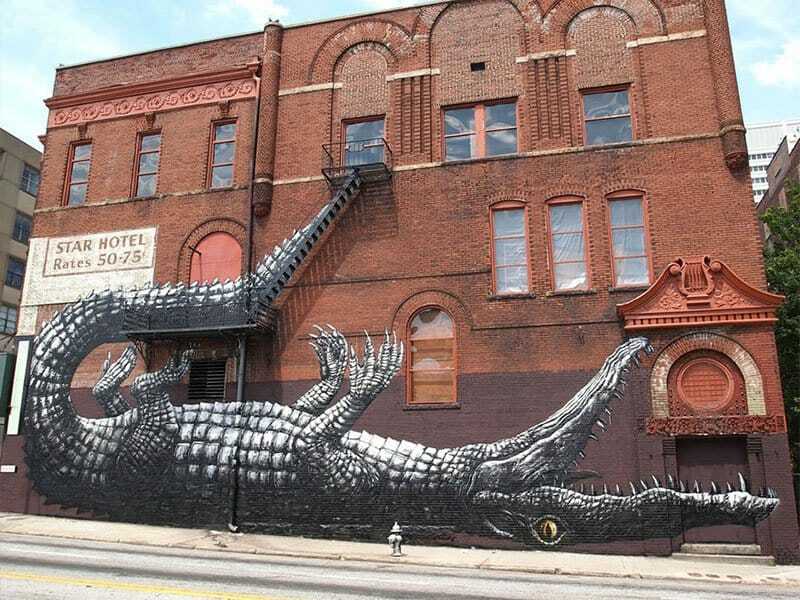 His oversized monochrome murals show thought-provoking messages that we should act upon. In highly urbanized developments, trees are now sparse and dying. 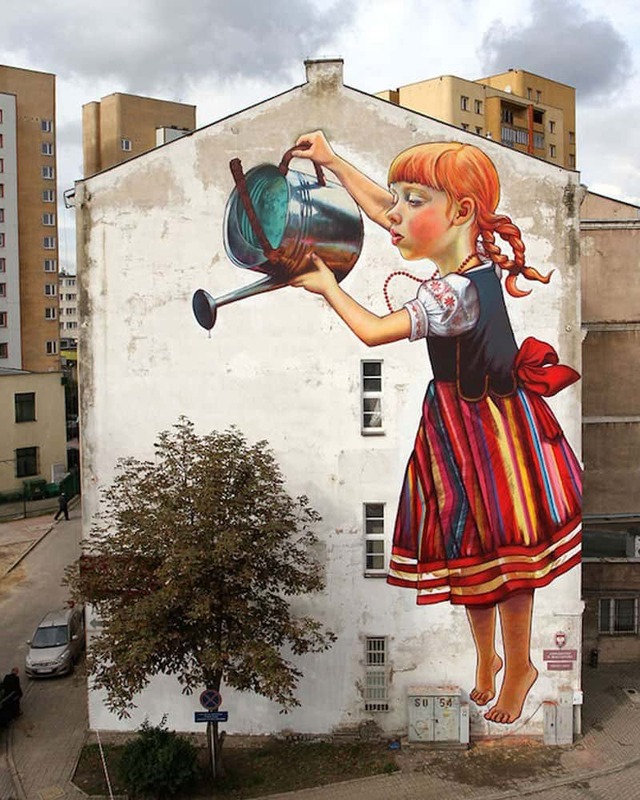 The street art shows a giant girl watering the ‘plant’ and trying to keep this rare sights alive. 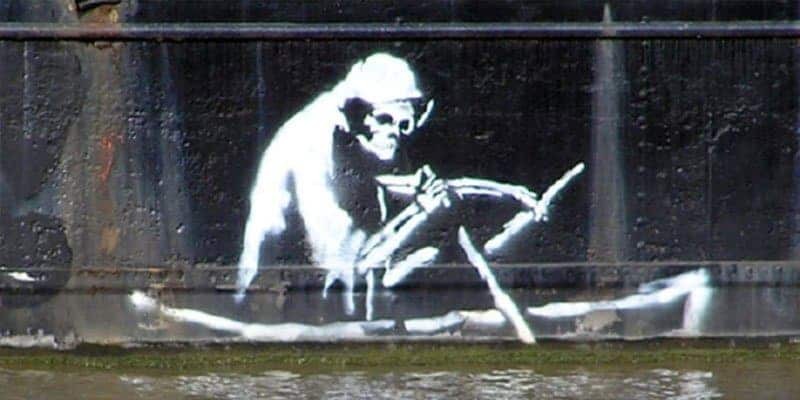 This Banksy art portrays the Grim Reaper on a boat, signifying that death is imminent in this oil-filled vessel. 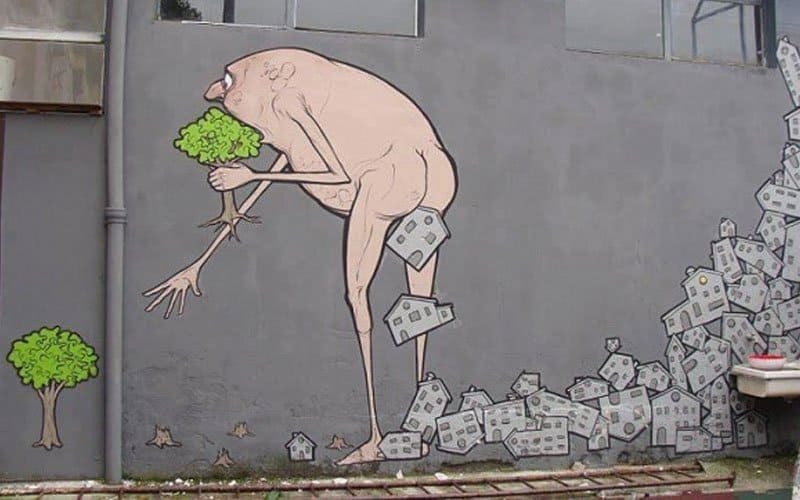 This public art display shows a clear picture of the human process of development: consuming the very last of the trees for urbanization. The street display can’t be any more literal: our world is going down the drain because of irreversible human actions. 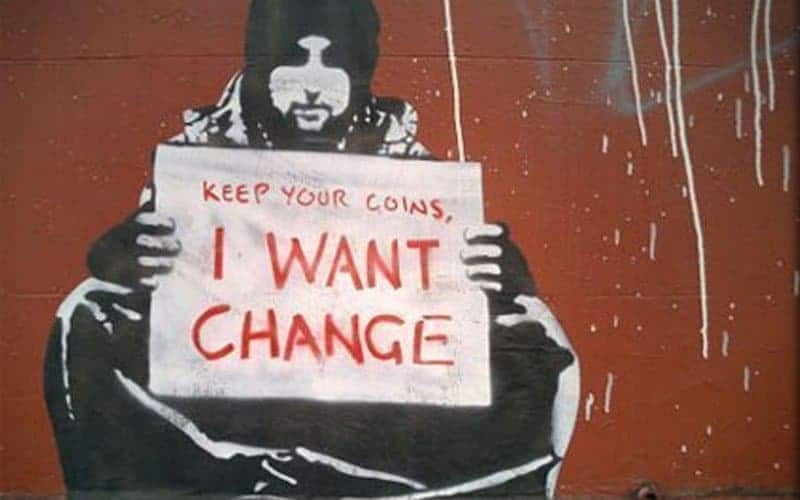 A street art display depicting a homeless person wanting for change, by mysterious and famous graffiti artist Banksy. The public art is a commission, but the message is still strong and true. 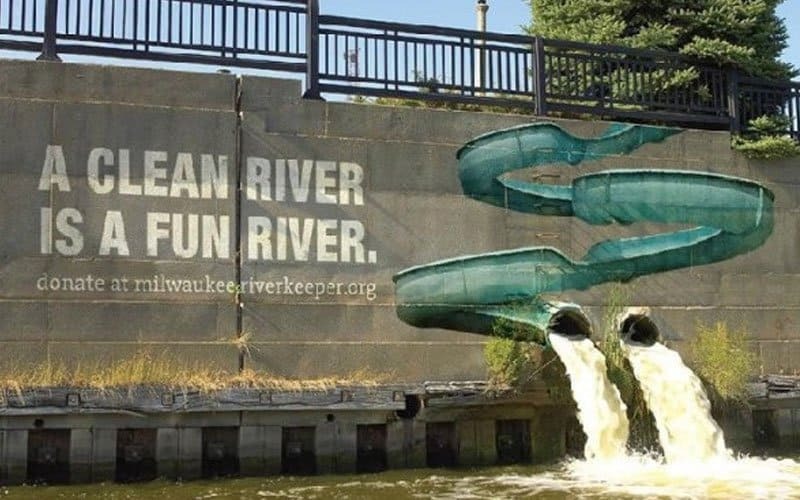 Keep our rivers clean for the future generations.